John Stark Hill was born April 16, 1950 in East Orange and grew up in Franklin Township in Somerset County. He attended Franklin High and starred on the Warriors’s offensive defensive line. He also was one of the state’s top shot putters for the Franklin track & field squad. 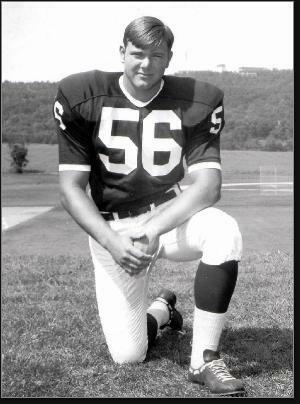 John went to Lehigh University on a football scholarship. Under Frederick Dunlap, the Engineers used tricky ball handling, misdirection and a complex passing attack to make up for a size deficit against stronger schools. John played center and was the star of the line that helped produce 362 points and an 8–-3 record in 1971. He earned all-ECAC and first-team All-America honors that season as a senior. He was also named Football Roundup’s Exemplary Player Award. John also competed in the shot put for the Engineers. John was selected by the New York Giants in the sixth round of t he 1972 draft. He saw some action as a rookie and became a starter the next year at left tackle after an injury to Willie Young created a hole in the offensive line. He started 7 more games in 1973 but the Giants waived him after the season. 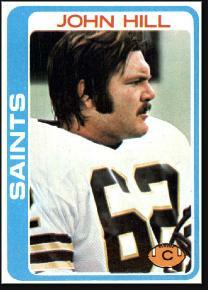 The New Orleans Saints grabbed John and inserted him into their starting lineup in 1974. He split time between center and tackle that first season and then became the starter for the next 9 years. John played a total of 10 years with the team, and was a co-captain for four. For most of the time, they were known as the “Aints.” In the late 70s however, the team showed encouraging signs of life. In 1983, after the Saint won four of their firs six games, John was among a group of players who recorded the team’s “Who Dat” song with Aaron Neville. They finished the year 8–8. John played one more year with the Saints and was released in the spring of 1985. John played one more NFL game, with the San Francisco 49ers that fall. After football, he ran an insurance agency in Raleigh, North Carolina. John was enshrined in the Saints Hall of Fame in 1992. He was the first offensive lineman to earn this honor. In 2006, he was named to the Saints’ 40th Anniversary Team. In 2014, John was added to the College Football Hall of Fame ballot, although he did not receive enough votes.